Axis 3 of LABEX MMCD, as opposed to axis 2, is devoted to the rheological behavior of materials in large strain regimes, with possible applications, in particular, to civil engineering and construction materials at elaboration stage (fresh cementitious mixes, gypsum, granular materials…). Those often contain pasty, non-Newtonian fluids and discrete objects or inclusions (grains or bubbles). Special attention is paid to multiscale approaches apt to capture the physical origin of macroscopic behavior at the level of constitutive elements (grains, colloidal particles…). Complementary knowledge and skills, from the different laboratories and research groups, in the design and processing of well controlled and characterized model materials, in rheometry and visualisation techniques, and in numerical simulation methods at different scales are being used synergistically. The LABEX support provides decisive impulses to collaborations combining experimental and mathematical tools and modeling schemes developed in various laboratories for the study of the rheology of complex and heterogeneous liquids or soft solids, and strengthens the position of the participating research groups as major actors in this scientific field. Researches carried out fall into three main themes. 1) Elaboration, characterization and modeling of nanocomposites. Such materials are made on mixing solid nanoparticles into polyelectrolyte solutions, and then drying. These nano composites are used for paintings, insulating layers, and coatings in several industrial fields, including construction. Other composite materials use swollen hydrogels as the continuum phase (in which the hydrosoluble polymer is reticulated), a soft solid retaining a large water content, which is also reinforced by small particle inclusions. This research includes Clément Robin’s PhD thesis, defended in October, 2016, the postdoc internship of Filippo Ferdeghini (2015-2016), and the ongoing PhD work by Azad Erman (2016-2019). Supervised by Catherine Amiel, Clémence Le Cœur, and Cédric Lorthioir at ICMPE-SPC and by Guillaume Ovarlez (now working at LOF, Bordeaux) and Abdoulaye Fall at Laboratoire Navier, Clément Robin studied the rheology of polymethacrylic acid (PMAA), and considered different kinds of silica nanoparticles in aqueous dispersion of PMAA with the possibility to control polyelectrolyte/silica interactions by varying either the pH or the silica surface functionalization. 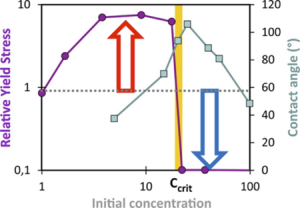 Polyectrolyte configuration changes caused by shear were also investigated. A variety of techniques were employed to vary polymer-silica interactions and monitor microstructure changes under shear (such as small angle X-ray or neutron scattering, possibly under shear flow). Unexpected rheological behaviours in the context of polymer solutions, such as shear thickening (Fig. 1), were observed and correlated to microstructure. Azad Erman’s PhD research, with the same supervisors from ICMPE and Navier laboratories, investigates rheological properties and their relations to microstructure at higher polyelectrolyte concentrations in the presence of the silica filler, and during drying — with the final objective of controlling the mechanical properties of the solid material (Young modulus, strength, aging). For applications to paintings, controlling the rheology (yield stress, thixotropy) in the liquid state is of course another industrial motivation of those studies. The structure of polymer-silica dispersions is investigated by techniques such as small angle scattering (of X-rays or neutrons), thus monitoring possible phase separation and formation of aggregates, depending on pH, polymer concentration and polymer/silica ratio. The composition of the phases is analysed by a thermogravimetric technique. 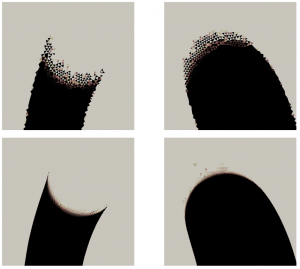 The drying process is studied for droplets on a substrate, the morphological evolution of which is directly observed under the microscope (Fig 2), while nanoscale restructuration is monitored in-situ by SAXS (Fig. 3). Fig. 2: Drying of a droplet in confined geometry. Initial droplet diameter ≈ 3 mm. Fig. 3: Evolution of silica structure during in-situ drying by SAXS. A characteristic peak appears at a certain silica concentration. As a postdoctoral research fellow, Filippo Ferdeghini collaborated with the same groups at ICMPE and Laboratoire Navier (where Stéphane Rodts, a specialist of Magnetic Resonance techniques applied to rheometry and to porous media is also involved). He studied hydrogels with platelet-shaped micrometrical solid inclusion highly sensitive to magnetic fields, with the aim of controlling their orientation and its influence on the viscoelastic properties of the composite medium. So far the experimental setup has been designed (enabling the application of a magnetic field to the sample in the rheometer), and appropriate mixtures have been chosen. The effects of magnetic fields and of particle orientations investigated. MRI experiments, coupled to rheometry, have been carried out. This research benefits from the association, fostered by the LABEX, of physico-chemistry and microstructures characterization techniques available at ICMPE (in group SPC, Systèmes de Polymères Complexes) and of the competence of the Navier group in rheology, rheometry and magnetic resonance imaging. This collaboration may lead to research proposals submitted to funding agencies such as ANR. A second set of research projects funded by the LABEX has been dealing with heterogeneous complex fluids, in the presence of interfaces and, especially, bubbles: the design, controlled fabrication and rheological modeling of aerated materials, with applications in civil engineering and construction industries, is a core project of the rheophysics group of Laboratoire Navier. The support of LABEX MMCD fostered collaborations with ESYCOM researchers (particularly in the CMM group—‘Captors and Measurement Microsystems’) who contributed their know-how in the design and fabrication of controlled millifluidic devices and surfaces with preset micrometer scale roughness characteristics. The PhD thesis research carried out by Benoît Laborie, in years 2012-2015, supervised by Élise Lorenceau and Florence Rouyer (Lab. 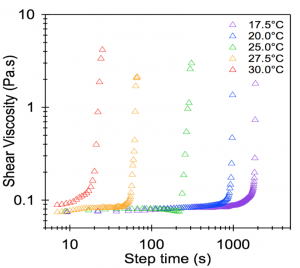 Navier) and by Dan Angelescu (ESYCOM-CMM), led to useful results about the mechanisms by which aerated yield stress fluids (YSF) can be prepared using millifluidic devices (see figure 4) and the regimes of flow of such bubbly YSF’s in capillary tubes. This work (about which 3 papers are now published in major international journals) paved the way to controlled, stable automated aerated YSF production. Fig. 4: Devices used to form controlled bubble trains within yield stress fluids (YSF) flowing in tube of radios 1mm. (a) T-junction, (b) Flow focusing. Three other PhDs started in October 2015 on related subjects: two experimental ones, by Blandine Feneuil (supervised by Olivier Pitois and Nicolas Roussel, of Laboratoire Navier), and by Xiao Zhang (associating Lab. Navier, with Ph. Coussot and J. Goyon, to ESYCOM, with Philippe Basset) and a computational one, by Karol Cascavita (supervised by Alexandre Ern, of CERMICS, and Xavier Chateau, of Lab. Navier). Xiao Zhang’s work ones again exploits the ability of the ESYCOM group to produce elaborate objects with a controlled geometry on a micrometric, or even nanometric scale — in that case, surfaces with specified roughness, grooves, etc… — to carry out innovative flow experiments and rheometric tests with complex fluids. The use of roughness scales varying from manometric (extremely smooth sicicium surfaces) to submillimetric (considerably larger than droplet sizes), in flows of emulsions past solid surfaces, evidenced the gradual disappearance of wall slip for growing roughness, while the wall yield stress increases from zero to the bulk yield stress. Other geometries (small capillaries, elongational flow in squeezed films), and the joint use of rheometry and MRI, allow the PhD student to investigate the applicability of known models in varying situations, testing for possible size effects (not recorded so far), and the appropriate tensorial forms of constitutive laws. Further studies of slip flow with a variety of systems in different geometries revealed that conventional observations are often influenced by flow edge effects, and led to reinterpretation of slip models. Once edge artefacts are eliminated, the wall slip velocity varies linearly with the ratio of shear stress to the interstitial liquid viscosity in the emulsion, thereby showing that the surface behaviour is that of a Newtonian layer of almost constant thickness for a wide range of materials with different structures, interaction types, and concentration. Fig. 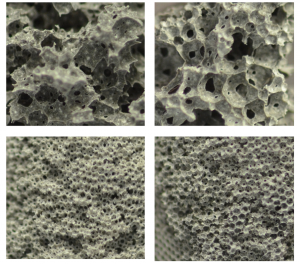 5: Solidified cement foams that were affected (left column), or not (right column) by drainage; and/or affected (top row) or not (bottom row) by ripening. While this project tracks basic laws in model systems, Blandine Feneuil’s thesis deals with cementitious materials, with the aim of producing and characterizing aerated cements and concretes. This thesis benefits from the knowledge of cementitious materials developed within IFSTTAR, the civil engineering institute which is one of the parent institutions of Laboratoire Navier (a joint lab with Ecole des Ponts and CNRS). N. Roussel, one of the thesis supervisors, has been working on cement pastes and concretes at IFSTTAR for about 15 years. The strong effects on yield stress of the nature and concentration of the surfactant, which interacts with cement grains, was systematically studied. Conditions enabling good control of the possible foam destabilization mechanisms before the hydration reaction solidifies the material (drainage, gas exchange leading to ripening, film breakage and coalescence, see Fig. 5) were identified. Coalescence might be avoided either with a large enough plastic capillary number (involving bubble diameter, yield stress and surface tension), or via a newly identified `granular confinement’ mechanism. Fig. 6: Effect of anionic surfactant concentration on cement paste’s yield stress and water contact angle of cement particles. 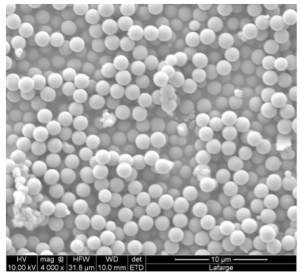 Although many surfactant molecules are available to produce stable aqueous foams, these molecules can strongly interact with cement grains. We focus therefore here on the interactions between various surfactants and cement grains in order to identify some selection criteria for surfactants dedicated to foam cement production. First, we check the surfactant ability to produce aqueous foam in synthetic cement pore solutions. Then, we observe that most surfactants do adsorb onto cement grains, inducing concentration-dependent effects on the yield stress of cement paste (see Fig. 6). Our results suggest that, for some of these surfactants, the yield stress increases significantly as inter-particle hydrophobic attractive forces develop at the surface of the grains. However, above a concentration threshold, those attractive forces sharply drop because of the formation of surface micelles acting as steric barriers between particles, which results in a strong decrease in yield stress. Fig. 7: Optimal value for the yield stress of cement paste for stabilizing cement foams. Production of morphology-controlled cement foams remains challenging, mainly due to bubble stability issues during cement setting. The use of cement paste with high yield stress is expected to promote stability by damping intrinsic bubble kinetics, but concurrently air incorporation and morphology control become delicate. 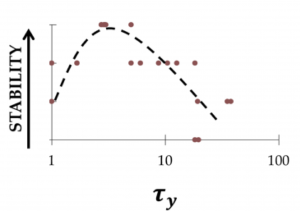 It was shown that for a given W/C ratio, fresh foam stability can be achieved instead by decreasing the paste yield stress below a critical value τ* (Fig. 7). This result is obtained for two distinct additives used at controlled concentrations and without resorting to set accelerators: (i) a superplasticizer/nonionic surfactant mixture and (ii) a single anionic surfactant, which highlights the general significance of the underlying stability mechanism. Thanks to measurements for the foam yield stress we show that τ* is the hallmark of optimal particle interactions as tuned by the additive concentration: for τ<τ* the van der Waals attraction is reduced and cement grains are allowed to be efficiently packed by bubbles, providing enhanced mechanical properties that own to granular matter. In such a case the effective yield stress of the bubble-embedded paste is shown to be increased by several tens with respect to the intrinsic (i.e. unconfined) yield stress t. For τ>τ* the van der Waals attraction does not allow the cement grains to be rearranged by bubbles, so the effective yield stress is equal to the intrinsic yield stress, which is not sufficient for ensuring foam stability within our experimental conditions. For τ<<τ*the van der Waals attraction is ineffective and the system is significantly deflocculated. In such a case none of the mechanisms described above is strong enough for ensuring foam stability. Fig. 8. Bingham pipe flow across a cross section with eccentric inner annulus. Velocity field (colormap) and unyielded region (gray) at the second and at the fourth step of the adaptive procedure. Discretization by the HHO method. The work of PhD student Karol Cascavita Mellado is being carried out within CERMICS, the Applied Math. Lab. of École des Ponts (with Alexandre Ern), together with the rheophysics group at Lab. Navier (X. Chateau and J. Bleyer). The aim of this research is to develop innovative discretization methods for the numerical modelling of non-Newtonian yield fluid flows. 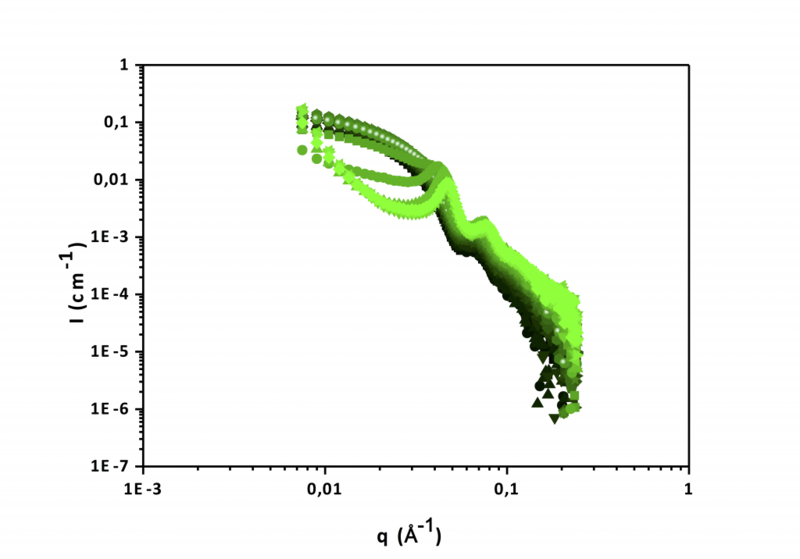 The starting point is the Hybrid High-Order (HHO) method introduced in 2014-15 by D. Di Pietro and A. Ern to approximate linear diffusion, elasticity and Stokes flows. The key idea is to use face-based unknowns together with cell-based unknowns and to formulate the method using local reconstruction and stabilization operators. The cell-based unknowns can be eliminated locally by static condensation which leads to significant computational savings since the only globally coupled unknowns are the face-based ones. The salient advantages of HHO methods are local conservativeness, the possibility of achieving high accuracy by raising the degree of the face and cell unknowns, robustness in the incompressible limit, and, perhaps most importantly, the possibility of using general meshes with polyhedral cell shapes and hanging nodes. The first main contribution of the PhD thesis is the devising of HHO methods for nonlinear problems formulated as variational inequalities and their numerical solution by means of augmented Lagrangian methods. Important software developments have been accomplished to that purpose within the Open-Source library disk++ developed at the CERMICS Lab. to discretize by HHO-type methods several model problems in nonlinear fluid and solid mechanics. One important aspect in this PhD thesis has been the development of adaptive meshing strategies to refine locally the mesh near the yield surface separating unyielded from yielded regions. The adaptive procedure is fully automatic; it starts by a marking step identifying those cells in the vicinity of the yield surface to be refined, followed by a local barycentric refinement of those cells and a possible adjustment of neighboring cells so as to keep the number of hanging nodes within a prescribed threshold. The procedure has been successfully tested on Bingham pipe flows across circular and eccentric annulus cross sections. 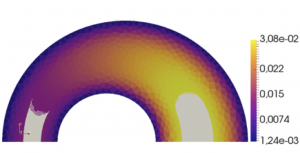 Adaptive meshes for the case of an eccentric annulus cross section together with colormaps for the velocity field and the unyielded region are shown in Figure 8 after several steps of the automatic adaptive procedure. Fig. 9: Bingham pipe flow across a cross section with eccentric inner annulus. Zoom of two regions about the yield surface. Top row: calculation using uniform triangulation with mesh size 0.0075. Bottom row: calculation using this mesh after six stages of local refinement. Both meshes involve about the same number of degrees of freedom. Discretization by the HHO method. To illustrate the benefits of adaptivity, we present in Figure 9 a zoom of two regions around the yield surface where we compare the results obtained using a uniform triangulation of the flow domain (top row) and an adaptive triangulation with hanging nodes (bottom row). Both triangulations lead to essentially the same number of degrees of freedom, but because of local mesh refinement, the adaptive triangulation has ten times smaller mesh cells near the yield surface, thereby leading to a much sharper capture of the transition region. A second step of the PhD thesis has been to extend the above developments to more general geometries beyond the anti-planar configuration encountered in pipe flows. Results with close agreement to reference solutions from the literature have been obtained for the lid-driven (two-dimensional) cavity and are currently being explored for counter-rotating cylinder configurations. Finally, as a step towards accounting for the presence of two immiscible fluids (for instance an air bubble trapped within a yield fluid), theoretical and numerical developments have been made to devise HHO methods on unfitted meshes. The key idea is to formulate the discretization methods on meshes that do not follow exactly the interface. This simplifies considerably the mesh generation step. By using a Nitsche-type penalty formulation on the interface, it is possible to design a discretization method that allows the interface to cut within the mesh cells. Finally, a third set of LABEX-funded projects, (collectively defined as a ‘transverse projet’ within the new LABEX organization) with one PhD thesis and two postdoctoral positions, is currently inevstigating particle-scale structure and dynamics of colloidal suspensions. An original combination of optical tools designed within ESYCOM, and microscopy and rheometry techniques used in Laboratoire Navier, will be applied to correlate microstructure and rheology, and, also, to better characterize particles interactions. Molecular dynamics simulations will be carried out in parallel with the experiments. PhD student Francesco Bonacci has been characterizing the microstructure and rheology of silica suspensions, combining geometry with observations by confocal microscopy. A collaboration with Eric Furst (University of Delaware) has been set up to directly investigate the interaction of those particles with means of optical tweezers.